Congratulations, you’ve made it to the best part of planning your wedding: cake tasting! With all the stress and pressure that comes with wedding planning it’s nice to know that you have this one activity that is not only delicious, but productive too. 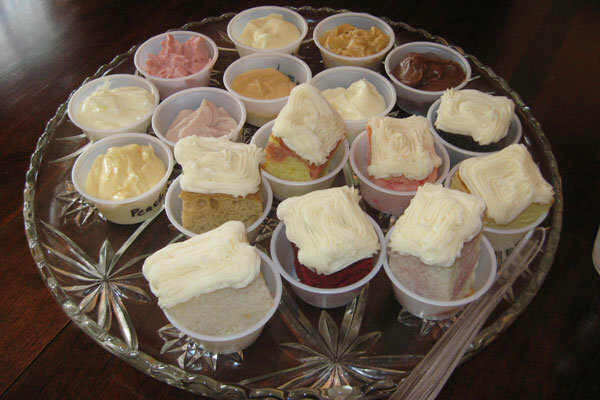 But, as with all aspects of planning a wedding, cake tasting can quickly become overwhelming. We’re here to help guide you through the process and make sure you pick the perfect cake. One of the easiest mistakes to make is scheduling all of your cake tastings in one day. In general, most cake vendors and bakeries offer 4-5 types of cakes and 4-5 types of frostings and fillings per tasting. Even for someone with an extreme sweet tooth, this adds up to be a LOT of sugar after the second tasting. By the time you get to your third tasting, you’ll most likely never want to see another slice of cake again. Be smart and spread out your tastings so that you’re not doing them all in one day. If you’re on the tasting stage of your wedding cake selection, you probably already have a good idea of the style, design, budget and size of cake you want. Bring lots of photos and details of what you’re looking for so that the cake designer can get started with a sketch. If you and the designer don’t reach a mutually satisfactory design, then you know this vendor is not the one for you. Take lots of detailed notes about what the designer and chef say about the cake so that you can compare and contrast each vendor after you complete all of your tastings. Ask the bakery how big their slices are to get an idea of how big of a cake you’ll need to order to feed all of your guests. If the bakery’s idea of a slice of cake is much larger than yours, you can easily order a smaller, more budget-friendly cake. If you’re having an outdoor wedding, you’ve probably already taken the temperature into consideration for most of your other vendors. It’s important to keep in mind that heat will melt and destroy a wedding cake fairly quickly. Buttercream and chocolate icings tend to melt the quickest, whereas fondant holds up better in high temperatures. Have you ever gone grocery shopping on an empty stomach and ended up buying all kinds of things you don’t really want or need? Tasting wedding cake on an empty stomach is a similar experience. If you arrive hungry, you’re more likely to think each cake is the most delicious cake ever baked and your stomach will dictate your opinion more than your taste buds. Eat a meal before a cake tasting so that you are able to actually taste the cake rather than scarf it down. Most vendors will provide cakes, frostings and fillings for you to taste. The best way to determine which are your favorites is by tasting all of the cakes together, then all of the frostings, then all of the fillings. This will give you the opportunity to really taste each flavor individually. It is also a good idea to start with the lighter, airier cakes (like angel food cake) and progress through, ending with the richer, denser cakes (like dark chocolate). The chef should be able to suggest an order for you to taste each cake. After tasting each item separately, mix and match your favorites to find a winning combination. Don’t be afraid to try an unusual combination if it consists of flavors that you or your partner enjoyed. Also trust your vendor’s combination ideas because, after all, they are the professionals here. Drink water throughout your tasting to stay hydrated and keep your palate as cleansed as possible when tasting all these sugary confections. Having a neutral palate will allow you discern between different flavors and textures and differentiate between each one. Cake tasting is widely considered to be the best part of wedding planning. Learn how to successfully taste wedding cakes in our handy guide. There is a vendor that had a cake at the bridal extravaganza. I didnt get their name and i want that cake. I believe he said it was a coconut flavored cake. I am NOT a fan of coconut but this guy won me over. The cake it self was blue and had white icing. I want that cake for my wedding. Is there any way that anyone may know who this vendor was?? Have you tried calling the place that held this event and making connections from there? Or maybe you remember the name of a vender/have their business card that was very close to him at the event that would remember him?